The timeless style of timber sash windows has been a prominent feature of architectural history for over 300 years. The oldest surviving examples of sash windows were installed in England in the 1670s. Narrow sightlines, intricate profiles and periodic styling has kept the sash window at their position as the premium window style throughout history. Combining traditional aesthetics with innovative design, Warmlite can provide superior range of sliding sash windows. We can offer a range of high performance products that can match most period styles. These sash windows offer exceptional thermal performance as standard with an ‘A’ rated option available. Our windows can be adapted to replicate traditional period window styles based on our wide range of design and layout options as well as our extensive glazing, timber and paint options. Fitch Catch Traditional locking catch allowing the window to be closed securely and applying pressure to the meeting rail seal providing excellent weather sealing. The catch comes with a lock as standard, but can be specified without and is available in a full range of finishes. Sash and Frame Vents Warmlite are able to offer a wide range of ventilation options, both in the sash and the frame. Options include canopy vents and flush vents in a range of colours and styles. It is also possible to colour match vents if required. Accoya Linings Often a very weak point in sliding sash windows, the linings are exposed to the conditions and due to their narrow sections cannot be made from engineered timber. By using Accoya timber, an advanced timber with exceptional durability, we can ensure you that this is no longer a weak point on the window. Internally Beaded All our sash windows are glazed from the inside providing improved security and better weather performance as well as protecting the bead resulting in better durability. Our sashes are also vented and drained ensuring the glazing system is protected allowing it to provide long term. Astragal Bars Our astragal bars, through precise manufacturing methods and high quality craftsmanship accurately counterprofile to the sash giving an unsurpassed finish. Draught Seals All Warmlite products have multiple draught seals providing excellent weatherproofing and thermal insulation. All Warmlite timber sash window installations are covered by our 10 year guarantee. This gives you the peace of mind that in the unlikely event something should go wrong with your timber sash windows, you can get them fixed quickly and conveniently at no cost to you. The guarantee covers material defects in profile materials, panels and glass units. 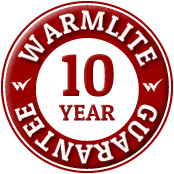 In the very rare event that a problem develops during the ten year period with your timber sash windows, Warmlite will simply replace the affected product. The Warmlite range of timber sash windows has been developed to allow our ultra-high performance to be fitted to replicate the typical features throughout the windows history, without compromising performance. Based on original designs using cord and weights, which as a counterbalance method still provides the best method (especially with larger, heavier window sashes). Our innovative design and advanced manufacturing processes coupled with the best materials has improved this window to perform very much like the more modern windows in the range. These windows have a similar appearance to our traditional sash windows but by using a spiral spring balance have narrower frame profiles. This high quality balances and innovative seals provide excellent thermal and weather performance. This opening method is the lowest priced within the sliding sash range. These windows have a similar design to the spiral balance option but enable the window to tilt inwards to allow cleaning from the inside. Recent developments have overcome many of the issues that affect the draught-proofing of tilting windows, providing performance levels close to the non tilting versions. Our timber sash windows use high quality Allart ironmongery giving the finish and performance you would expect from a Warmlite window. All ironmongery has been selected to retain the traditional appearance of the product, whilst meeting the highest criteria of external tests for window operability. A traditional locking catch allowing the window to be closed securely. It applies pressure to the meeting rail seal providing excellent weather sealing. The catch comes with a lock as standard but can be specified without and is available in a full range of finishes which are shown below. Sash pulls are available in the full range of finishes and allow the sashes to be easily opened and closed. The sash can be specified without pulls if requested. The top sash is specified as standard with a sash eye on the top rail but can also be provided with a D handle on the underside of the meeting rail (this provides a lower point for access but requires the bottom sash to be opened to access). For spring balance and tilting sliding sash windows, the balances are available in white and brown and the tilting channels are provided in white or brown. As standard we will specify the colour that we deem most suitable to the paint colour but you can specify an alternative if required. Sash stops allow the window to be opened for ventilation, but restrict further opening providing safety to people in the building and preventing intruders from lifting the sash to gain access. The stops are fitted as standard at 15mm (usually meets Building Regulation Part F for trickle ventilation), but can also be fitted at 100mm to allow for additional ventilation, whilst still operating as a safety restrictor. They are available in Brass, Polished Chrome and Satin Chrome finishes only. Warmlite use certified Redwood Woodheart® as standard for our timber sash windows. We also have a range of hardwoods and Accoya modified timber to choose from. As standard all our frames and window sashes are manufactured from Redwood WoodHeart®, the heartwood taken from Nordic Scots pine trees (see diagram). By utilising this heartwood, we get very good durability and dimensional stability, as well as very good thermal performance. The reduced moisture uptake and increased stability of the timber produces a substrate which enhances the coating life span (this is key to a long life window because if the coating remains intact the window will last indefinitely). In addition it is engineered to be knot free, which along with the aesthetic effect, also prevents resin exudation, which will damage the coating. The cill on sliding sash windows and the cill extensions on all products (if required) are, due to increased exposure to weathering (both water and UV light), manufactured from FSC sourced hardwood. It is possible to supply our products complete in Redwood WoodHeart® (usually only if a transparent finish is required) and in addition the following four timber options. Provides a stable and durable substrate and is supplied as a three ply laminated material for extra stability. Available in long, clear lengths making it highly suitable for stain finishes where no finger joints are preferred. In the past, high quality windows have been made from European Oak due to its durability. However, it has a tendency to move which can cause failure of the coating system and the insulating glass units. To overcome these problems we use knot free laminated European Oak which has FSC Chain of Custody. Accoya is an exceptionally stable modified timber and has the highest durability rating. It provides the ultimate substrate for our coating system allowing us to give a coatings warranty of up to 12 years. Accoya also comes with FSC Chain of Custody. Sapele is a very stable and durable tropical hardwood that is very well suited to joinery manufacture. It’s dark and dense characteristics make it a very attractive timber, well suited to a transparent coating. We source this with FSC certification to ensure it is from sustainable, certified sources. Our advanced coating system has been developed to provide maximum protection to the timber, whilst allowing it to breathe and let its natural characteristics show through. This allows us to give a 10 year guarantee on paint finish. The coating system is vitally important for the longevity of timber windows and doors. It essentially serves three purposes; to prevent UV and visible light damage to the timber surface, to slow down the rate at which moisture is absorbed and released from the timber and to provide an attractive colouring and surface finish to the product. Warmlite can provide almost any opaque colour, all we require is a RAL Standard, RAL Design, Natural Colour System (NCS) or British Standard (BS 4800) colour or an actual sample. Warmlite can provide almost any translucent colour, all we require is a RAL Standard, RAL Design, Natural Colour System (NCS) or British Standard (BS 4800) colour or an actual sample. We can provide dual colour windows and doors with a different colour inside to out or frame to sash. This also allows for the frame and sash to have a different dual colour specification if required. For further information about our traditional sash windows, a free site survey with a no obligation quotation or to arrange an appointment.